We are very proud and honored that our new Catalina 425 was named Cruising World Magazine’s “Domestic Boat of the Year”. Not every naval architect gets the chance to take a second swing at a popular design a couple of decades after the splash of the original. 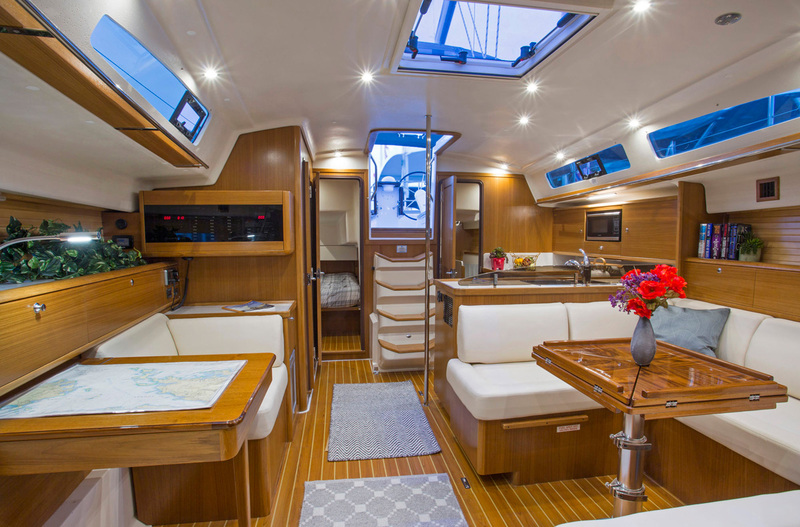 But that is precisely the opportunity that presented itself to Catalina Yachts designer Gerry Douglas with his Catalina 425. The company’s original 42-footer debuted 23 years ago, and before all was said and done, Catalina produced more than 1,000 units of the highly successful production boat. Now Douglas has taken all he learned in the intervening years and amalgamated that knowledge in the new 425. And he knocked it out of the park . That’s why we’ve awarded the 2017 Domestic Boat of the Year award to the Catalina 425. “It had a higher level of finish than some of the more expensive boats in its category,” noted Ed Sherman. “One of the things Douglas said when discussing his personal design brief was that he wanted to have excellent service access to all the systems. He achieved that goal and did a nice job with it. Everything was easy to get to, labeled properly and quite good in that respect. “Catalina did an excellent job with this boat,” said Carol Hasse. “There was a concerted focus on safety features. The target market is an experienced sailing couple in their 50s with plans for retirement cruising. This will be an excellent vehicle for that. So too were Hasse’s fellow panelists, which is why the Catalina 425 took home one of the two major awards for 2017.